This morning I woke up with the typical post-race soreness. Thankfully, my heel doesn't hurt any more than it has been hurting. So I don't think I did any damage there. And, my piriformis isn't sore at all. It's mostly calves and outer quads. Going down stairs is interesting to say the least. I did myself a favor and took the day off. I crashed out a little after 9 and slept until 7:30 this morning. Definitely needed the sleep. I stretched and rolled out for a bit before starting on chores. I felt like if I was home I needed to be productive. I had another physical therapy appointment this afternoon. I was really worried she was going to be furious with me for running. Actually, she understood. Did she think it was kind of stupid? Yes, but again, she absolutely understood. I think that's the great thing about having a PT who is similar in terms of workouts. She's a runner (actually a triathlete), so she truly gets "it." I was going to go to the grocery store after the appointment, but remembered the last time I tried going on a Monday at 5pm. So, I opted to put that particular to-do item off until later. Of course, this means getting a little more creative in the kitchen. Luckily, I had a couple of options to go with. Of course when I ran them by Jason, he chose the pasta option. 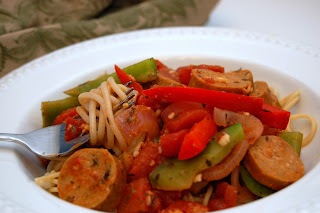 I had some Tofurky brand Kielbasa on hand as well as bell peppers, onions, and some tomatoes. 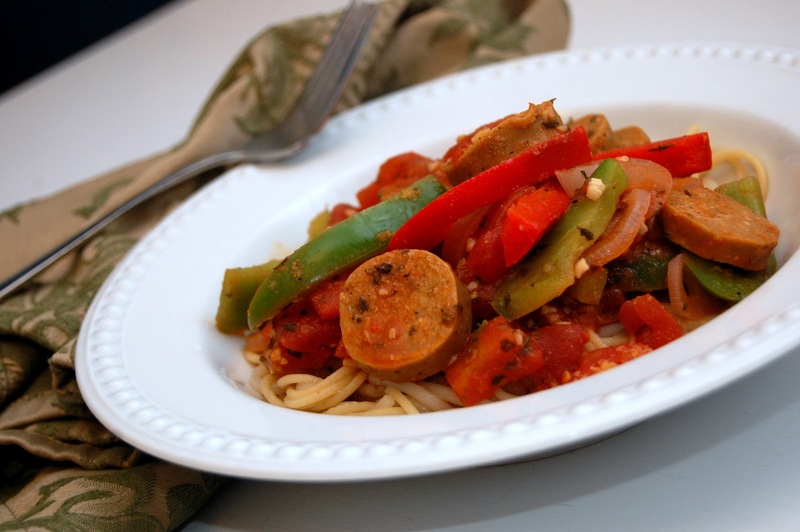 So I went with a Vegan Sausages and Peppers Pasta. In large non-stick skillet, saute onions for approximately 3-5 minutes then add in the wine, garlic, salt and pepper. Allow to simmer for another 5 minutes. Add in the peppers and remaining seasonings, tomatoes, and tomato paste. Allow to simmer and thicken for approximately 15 minutes. Add in the sausages and nutritional yeast and allow to cook until heated through. I love the base to this sauce (the wine, onions, peppers, garlic and spices). I got the idea originally from a Giada De Laurentis recipe for a peppers and sausage sandwich. But the base works so well for other things too - like adding in chickpeas for example. It's also great over spaghetti squash, quinoa, or couscous.